BACKGROUND AND PURPOSE: The combination of nonspecific clinical findings and similarities in morphologic appearances on imaging often makes it difficult to distinguish abscesses from other brain lesions. We present a retrospective analysis of in vivo 1H-MR spectroscopy data for characterization of the etiology of the brain abscess based on the established criteria and demonstrate the sensitivity and specificity of metabolite markers assigned to specific bacterial groups defined by the microbial culture in 194 patients. MATERIALS AND METHODS: Conventional MR imaging and in vivo 1H-MR spectroscopy data were evaluated from patients with pyogenic brain abscesses, with ages ranging from 3 to 60 years. Imaging and 1H-MR spectroscopy were performed on a 1.5T scanner. After MR imaging was performed and analyzed, pus aspirates were obtained in all patients. The causative organisms were confirmed by pus cultures. RESULTS: Resonance of AAs with or without other metabolites on in vivo 1H-MR spectroscopy was observed in 80% of abscesses, with a sensitivity and specificity of 0.72 and 0.30, respectively. Most obligate anaerobes and some facultative anaerobes showed the presence of Lac/Lip, AAs, and Ac with or without Suc. Mostly obligate aerobes or facultative anaerobes showed the presence of Lac and AAs, with or without lipids. CONCLUSIONS: The presence of AAs on in vivo 1H-MR spectroscopy is a sensitive marker of pyogenic abscess, but its absence does not rule out a pyogenic etiology. The presence of Ac with or without Suc favors an anaerobic bacterial origin of the abscess; however, this may also be seen in some of the abscesses secondary to facultative anaerobes. We present a retrospective analysis of in vivo 1H-MR spectroscopy data for characterization of the etiology of the brain abscess based on the criteria mentioned in the literature and demonstrate the sensitivity and specificity of metabolite markers assigned to specific bacterial groups defined by the microbial culture in these patients. We performed a retrospective study of patients with brain abscesses referred during a span of 7 years. These patients presented to us with various clinical features such as fever, headache, and/or mass lesion. In vivo 1H-MR spectroscopy was performed in a total of 210 patients with brain abscesses; however, only imaging of 194 patients with good spectral quality were included in current study. The remaining 16 patients were excluded due to the noninterpretable quality of spectra, either due to poor shim or motion artifacts. The final population (n = 194) consisted of 140 males and 54 females, with ages ranging from 3 to 60 years. After clinical evaluation, all patients underwent conventional MR imaging and in vivo 1H-MR spectroscopy, followed by aspiration of the abscess cavity. Before imaging, informed consent was obtained from each subject or nearest kin. The study was approved by the institutional ethics committee. Imaging was performed on a 1.5T MR imaging scanner (Signa LX EchoSpeed Plus; GE Healthcare, Milwaukee, Wisconsin) by using a standard quadrature birdcage transmit and receive radio-frequency head coil. The routine imaging studies included fast SE T2WI (TR/TE/NEX = 4900 ms/85 ms/3) and SE T1WI (TR/TE/NEX = 650 ms/14 ms/2) sequences with a matrix size of 256 × 256, FOV of 24 × 24 cm, and no intersection gap. We used T1WI or T2WI for voxel localization. Postcontrast T1WIs were acquired after intravenous administration of gadolinium-diethylene-triamine pentaacetic acid-bismethylamide (Omniscan; Amersham Health, Oslo, Norway) at a dose of 0.1 mmol/kg of body weight. The size, location, and multiplicity of the abscesses were recorded. When >1 lesion, either in the same section or in some other location, was observed in the brain parenchyma, the patients were considered to have multiple abscesses. In case of multiple abscesses, we selected the lesion with largest dimension on T2WI for spectroscopy. 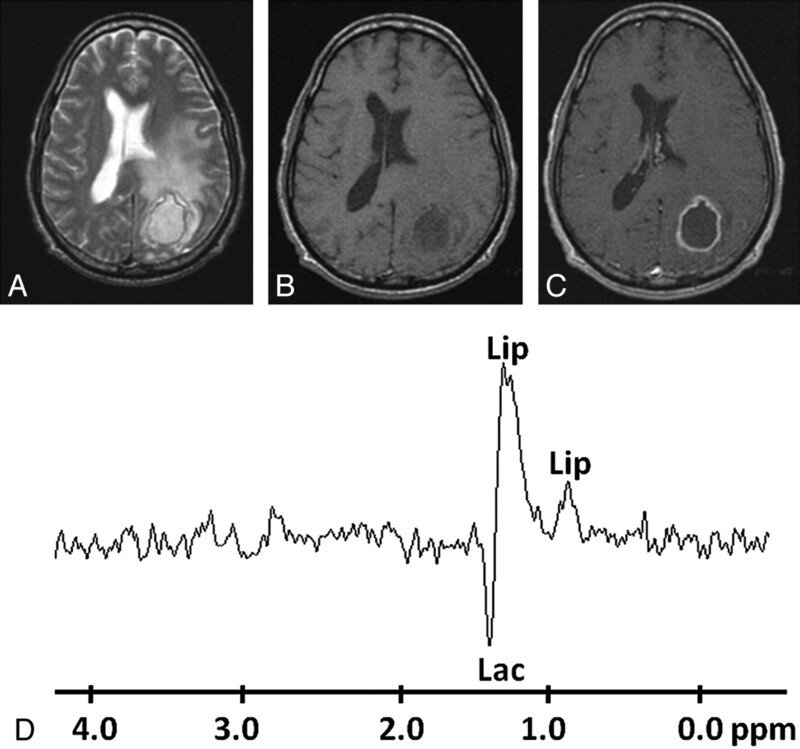 The morphologic features of the lesions were analyzed on conventional MR imaging. In vivo 1H-MR spectroscopy was performed in all patients by using a water-suppressed localized single-voxel SE sequence with TR/TE/NEX = 3000 ms/144 ms/8 and a voxel size of 2–3 mL, depending on the size of the lesion. We ensured voxel placement within the cavity of the lesion to avoid contamination from the surrounding brain parenchyma and the wall of the cavity (Fig 1A). After global shimming, we performed voxel shimming and achieved a full width at half maximum of 4–6 Hz in all cases. 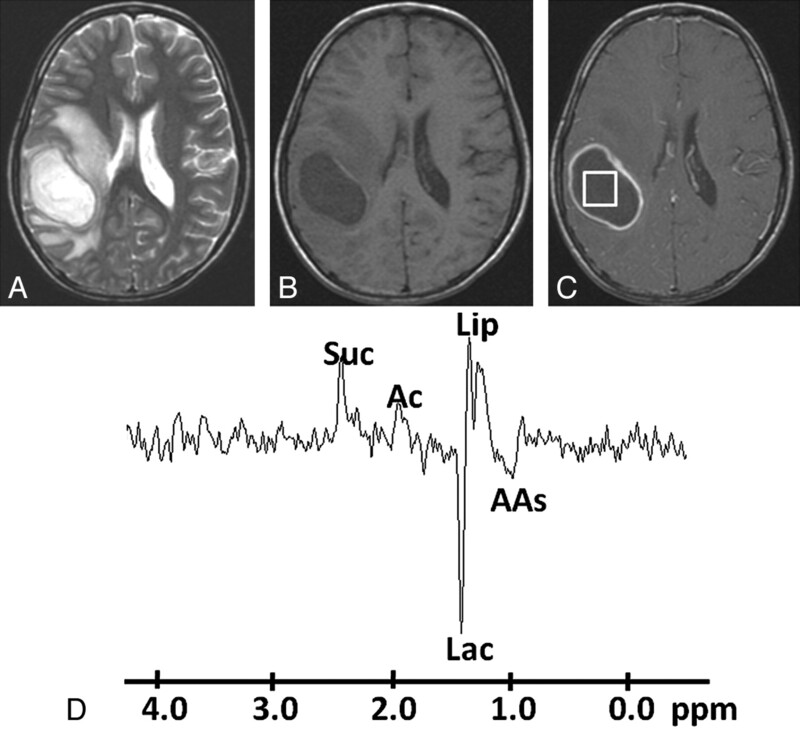 Only the long-TE technique was used because it has been observed that the metabolites in brain abscesses have intermediate-to-long T2 values and are well assigned at a TE of 144 ms.12 Resonances of AAs (ie, valine, isoleucine, and leucine), Lac, and alanine showed phase reversal at intermediate TEs, whereas the Lip resonances remained unchanged. The spectra with the partial phase reversal at 1.33 ppm were assigned to the presence of both Lip and Lac. Pyogenic abscess in the right parieto-occipital region of a 34-year-old man. A, Axial T2WI shows a well-defined hyperintense lesion with a hypointense wall and perifocal edema. B, The lesion appears hypointense on the axial T1WI with an isointense wall. C, Postcontrast T1WI shows ring enhancement. D, In vivo 1H-MR spectroscopy by using SE sequence (TR/TE/NEX = 3000 ms/144 ms/128) from the center of the lesion shows resonances of AAs, 0.9 ppm; Lip/Lac, 1.3 ppm; Ac, 1.9 ppm; and Suc, 2.4 ppm. Culture from pus grew B fragilis. 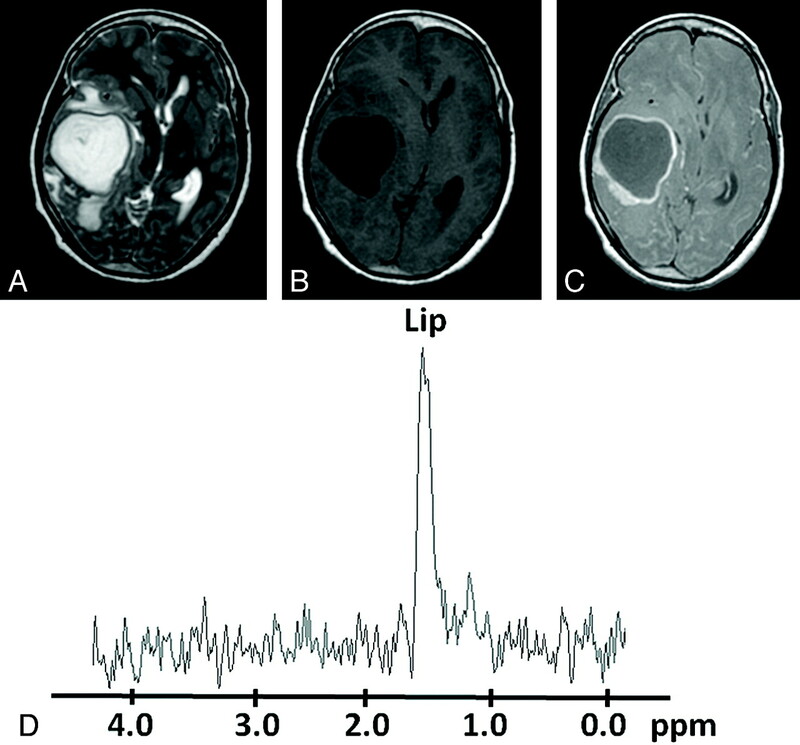 Two experienced neuroradiologists with >20 years' experience independently reviewed the MR imaging and spectroscopic data on all patients to determine the topographic location, morphology, and metabolites of abscesses. There was no variability in the interpretation of the data between neuroradiologists. For evaluation of all individual spectra, a standard Java-based version of an MR imaging user-interface signal-intensity processing software package (Version 6.0; jMRUI Europe project, Leuven, Belgium) was used for 1H-MR spectroscopy data. For spectral analysis, various spectral peaks of different metabolites in 1H-MR spectroscopy were identified. 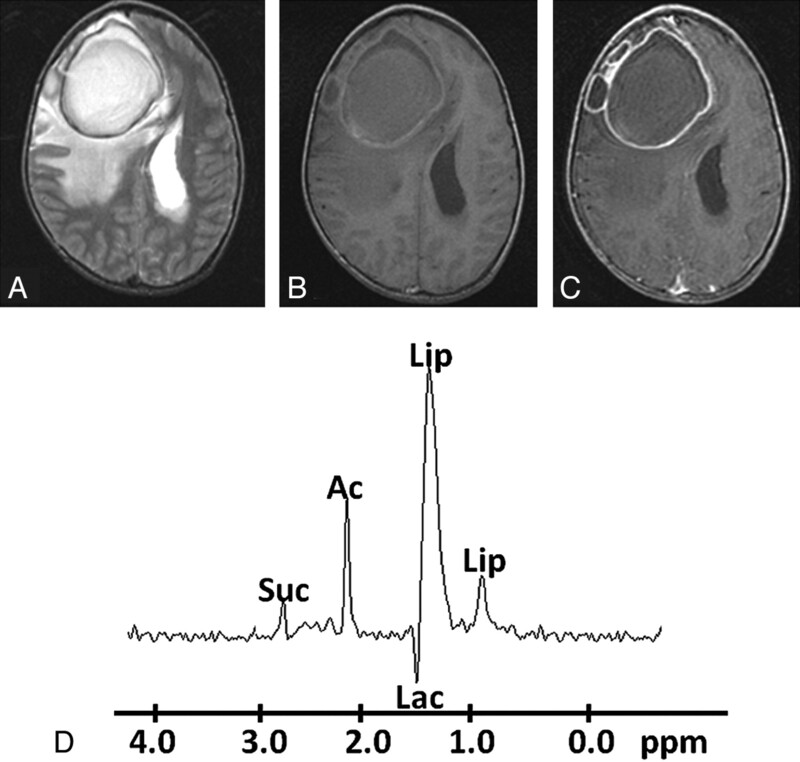 The presence of cytosolic AAs, such as leucine, isoleucine, valine (0.9 ppm) with or without Lac (1.3 ppm), Ac (1.92 ppm), Suc (2.4 ppm), and Lip (1.3 ppm) peaks, is used as a signature for brain abscess.7,8 When AAs at 0.9 ppm were detected on spectroscopy, it was labeled as a pyogenic abscess.7 Similarly, the abscess was considered to be of anaerobic origin when cytosolic AAs along with Ac and/or Suc were identified on in vivo 1H-MR spectroscopy.8,11 All the resonances were identified with reference to Lac at 1.33 ppm based on literature.12,13 The study in which we could not demonstrate the Lac water peak was taken as a reference at 4.77 ppm. where a is the number of patients who were both culture- and 1H-MR spectroscopy–positive, b is the number of patients who were only 1H-MR spectroscopy–positive, c is the number of patients who were only culture–positive, and d is the number of patients who were both culture- and 1H-MR spectroscopy–negative. Pyogenic abscesses were located in the parietal lobe in 8 (4%), the frontal lobe in 39 (20%), the temporal lobe in 58 (30%), the occipital lobe in 10 (5%), the frontoparietal lobe in 8 (4%), the parieto-occipital lobe in 9 (5%), and the cerebellum in 31 (16%) patients. However, multiple abscesses were seen in 31 (16%) of the 194 patients. All the lesions appeared hyperintense on T2WI and hypointense on T1WI, with variable perifocal edema, and showed ring enhancement on postcontrast T1WI. In vivo 1H-MR spectroscopy characteristics of all patients are summarized in Table 1. Resonance of AAs with or without other metabolites was observed in 155/194 (80%) abscesses on in vivo 1H-MR spectroscopy. On the basis of the presence of AAs, we observed the following sensitivity, specificity, and positive and negative predictive values of in vivo 1H-MR spectroscopy for the diagnosis of pyogenic abscesses: 0.72, 0.30, 0.80, and 0.20, respectively. AAs could not be detected in the remainder of the 39/194 cases (20%). Of the cultures of these 39 patients, 7(17.8%) were anaerobes, 3(7.8%) were aerobes, 18 (46.2%) were facultative anaerobes (Fig 2), and 11 (28.2%) were sterile (Fig 3). Staphylococcus aureus (14/18) was the most common facultative anaerobe that did not show the AA resonances. Acetate with or without Suc was observed in 46 (24%) of 194 cases. Of these 46 patients, 32 cultures (69.5%) were anaerobic: Bacteroides fragilis (n = 10) and Streptococci organisms (n = 22); 11 (24%) were facultative anaerobe: S aureus (n = 8) and Enterococcus species (n = 3); and 3 (6.5%) were sterile. Among 54 anaerobic culture–positive patients, we found that only 32 (59%) showed a peak of Ac with or without Suc (Fig 1). Based on the presence of these metabolites, the sensitivity, specificity, and positive and negative predictive values of in vivo 1H-MR spectroscopy were 0.70, 0.85, 0.60 and 0.90, respectively, for the diagnosis of anaerobic infection. We also found that Suc was always present in conjunction with Ac in these patients. Pyogenic abscess in the right frontal lobe of a 32-year-old man. A, Axial T2WI image shows a large well-defined hyperintense core with a peripheral hypointense rim, perifocal edema, and mass effect. B, The lesion shows mixed intensity on T1WI with a slightly hyperintense wall. C, Axial postcontrast T1WI shows ring enhancement. D, In vivo 1H-MR spectroscopy by using SE sequence (TR/TE/NEX= 3000 ms/144 ms/128) from the center of the lesion shows Lip/Lac, 1.3 ppm; Ac, 1.9 ppm; and Suc, 2.4 ppm. Culture from pus grew E faecalis. Pyogenic abscess in the left occipital lobe of a 28-year-old man. A, Axial T2WI shows a well-defined hyperintense lesion with a hypointense wall and perifocal edema. B and C, The lesion appears hypointense on T1WI (B) with an isointense wall showing ring enhancement on the postcontrast T1WI (C). D, In vivo 1H-MR spectroscopy by using SE sequence (TR/TE/NEX = 3000 ms/144 ms/128) from the center of the lesion shows only Lip/Lac peaks, 1.3 ppm. Culture from pus showed no bacterial growth. The bacteriologic data obtained from the pus cultures are summarized in Table 2. On the basis of the results of bacterial culture, abscesses were grouped as sterile (no bacterial growth), anaerobic, aerobic, and facultative anaerobic. There were 54 sterile (27.8%), 54 anaerobic (27.8%), 17 aerobic (8.8%), and 69 facultative anaerobic (35.6%) abscesses. Fifty of 54 patients with sterile abscesses had been on broad-spectrum antibiotics for 7–10 days before MR imaging and 1H-MR spectroscopy. Of remaining 140 culture–positive patients, 59 had also been on antibiotic therapy for 3–4 days before MR imaging. Anaerobic cultures were positive for anaerobic Streptococci organisms (n = 39) and B fragilis (n = 15); aerobic cultures were positive for Nocardia species (n = 10) and Pseudomonas aeruginosa (n = 7); and facultative anaerobic cultures were positive for S aureus (n = 38), Streptococcus uberis (n = 7), Streptococcus intermedius (n = 5), Klebsiella pneumoniae (n = 1), Eikenella corrodens (n = 2), Enterococcus faecalis (n = 8), Proteus mirabilis (n = 1), and Escherichia coli (n = 7). The presence of the resonance of cytosolic AAs is considered as a sensitive marker of pyogenic brain abscess7; however, in our study, we found that AAs were not always present in pyogenic abscesses. We found that AAs were present in 80% of the pyogenic abscesses with a sensitivity and specificity of 0.72 and 0.30 on in vivo 1H-MR spectroscopy. It is known that the abscess cavity contains a large amount of neutrophils and protein. Proteolytic enzymes are released due to the breakdown of the neutrophils. These enzymes hydrolyze the proteins into AAs, which are detected at 0.9 ppm on in vivo 1H-MR spectroscopy in pyogenic brain abscesses.15–19 However; we could not find AAs at 0.9 ppm in some of the patients having aerobes, anaerobes, facultative anaerobes, and sterile cultures. The absence of AAs in sterile abscesses was probably due to the fact that these patients were undergoing treatment with antibiotics20–24 before the in vivo 1H-MR spectroscopy, probably resulting in the lack of bacterial growth on the culture. 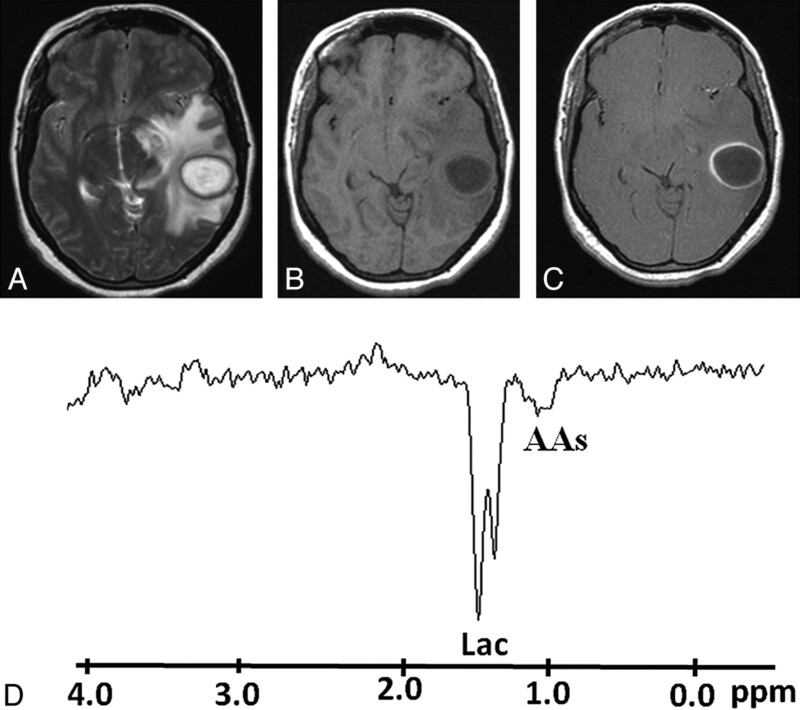 Earlier studies have also reported the disappearance of all resonances except those of Lac within the abscess cavity on in vivo 1H-MR spectroscopy following antibiotic therapy.10,25 The absence of AAs in patients with aerobic and anaerobic culture–positive brain abscesses on in vivo 1H-MR spectroscopy could be explained by the lower inflammatory cell count in the pus of these patients, resulting in a low concentration of metabolites, which was below the sensitivity of the 1.5T MR imaging.26 On the basis of these data, it appears that the presence of AAs is a sensitive marker of pyogenic brain abscess; however, its absence does not rule it out. Suc and Ac are usually not observed in brain abscesses secondary to aerobic (Fig 4) and facultative anaerobic micro-organisms because the pyruvate formed during glycolysis enters the tricarboxylic acid cycle in these bacteria in the presence of oxygen.8 In accord with the literature, we did not observe these resonances in any of the aerobic brain abscesses.8 However, we found these resonances in 11 patients demonstrating facultative anaerobes (Fig 5) on culture:11 S aureus (n = 8) and E faecalis (n = 3). E faecalis organisms are usually considered strict fermenters, and they lack a Kreb cycle respiratory chain29; this may be the reason for the resonances of Ac with or without Suc on in vivo 1H-MR spectroscopy in 3 patients in this study. The presence of Suc and Ac in patients showing no bacterial growth on culture may be attributed to the antibiotics that these patients received before MR imaging and MR spectroscopy, resulting in degeneration of anaerobic bacteria and persistence of metabolites in the lesion. Pyogenic abscess in the left superior temporal lobe of a 30-year-old woman. A, Axial T2WI shows a well-defined hyperintense lesion with a hypointense wall and perifocal edema. B and C, The lesion appears hypointense on the corresponding T1WI (B) with an isointense wall showing ring enhancement on the postcontrast T1WI (C). D, In vivo 1H-MR spectroscopy by using SE sequence (TR/TE/NEX = 3000 ms/144 ms/128) from the center of the lesion shows AAs, 0.9 ppm; and a predominant Lac peak, 1.3 ppm. Culture from pus grew P aeruginosa. Pyogenic abscess in the right temporal region of a 27-year-old woman. A, Axial T2WI shows a well-defined hyperintense lesion with a hypointense wall and perifocal edema. B and C, The lesion appears hypointense on the T1WI (B) with an isointense wall showing ring enhancement on the postcontrast T1WI (C). D, In vivo 1H-MR spectroscopy by using SE sequence (TR/TE/NEX= 3000 ms/144 ms/128) from the center of the lesion shows only a Lip peak, 1.3 ppm. Culture from pus grew S aureus. Although most of the strains of S aureus produce proteolytic enzymes, a few strains may not produce these due to genetic variability. The absence of these enzymes may result in nonproteolysis of the proteins within the abscess cavity and consequential absence of AA resonance on in vivo 1H-MR spectroscopy as we observed in our study.30 This observation is also supported by Himmelreich et al.31,32 Occasionally, facultative anaerobes like S aureus produce Ac with or without Suc in anaerobic environments by anaerobic glycolysis.33 This could explain the presence of these resonances on in vivo 1H-MR spectroscopy in S aureus abscesses. Another probable reason could be that the patients while on treatment might have had mixed obligate and facultative anaerobic infections initially, which had shown resonances of Ac and/or Suc on in vivo 1H-MR spectroscopy and yielded only a few obligate anaerobes and thus remained undetectable on culture. In the initial studies on brain abscesses, 1H-MR spectroscopy with short, intermediate, and long TEs has been used for metabolite identification.15,34 Subsequently, it has been observed that the metabolites in brain abscesses have intermediate-to-long T2 values and can be well assigned at a TE of 135 ms or 144 ms.5,8 We did not have any difficulty in the assignment of metabolites at 144 ms TE. In conclusion, though the presence of AAs on in vivo 1H-MR spectroscopy is a sensitive marker of pyogenic abscess, its absence does not rule out an abscess of pyogenic origin. Second, even though resonances of Ac with or without Suc on in vivo 1H-MR spectroscopy favor an abscess of anaerobic bacterial origin, these may also be seen in some abscesses due to facultative anaerobic microbes. Hence, caution should be exercised in categorizing brain abscesses on the basis of in vivo MR spectroscopy. This work was supported by grant 5/4–5/12/Neuro/2005-NCD-I from the Indian Council of Medical Research, New Delhi, India. Accepted after revision July 10, 2009.